Richard is a Consultant and one of the founding partners of Barcan Woodward (now Barcan+Kirby). 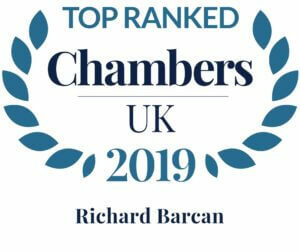 Richard has over 30 years’ experience in all aspects of medical negligence, ranging from catastrophic brain and spinal injuries, including cerebral palsy and maternal birth injuries, through to fatal injury claims. He was, for many years, a panel member of Action Against Medical Accidents and is ranked as a ‘Senior Statesman’ in the Chambers Guide to the Legal Profession.